Public Safety lobby at City Hall or any NRH Fire Station. The NRH Police and Fire Departments are holding a toy and food drive to benefit those who are less fortunate in our community. 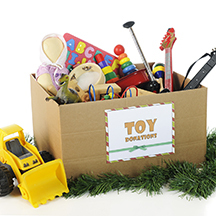 Residents are encouraged to share in the holiday spirit by dropping off new, unwrapped toys and nonperishable food items to the Public Safety lobby at City Hall, 4301 City Point Drive, or any NRH Fire Station. Donations will be accepted from Thanksgiving through December 19. All toy and food donations will go towards helping families in need through the Community Enrichment Center, Alliance for Children and other local community organizations.